...is a 27-day online course to guide and inspire you declutter in order to provide more clarity and peace in your life. Prepare for the Chinese New Year! eCourse BEGINS January 10th, 2019! Commit to creating a space that promotes clarity and much more! I want to guide you through this! 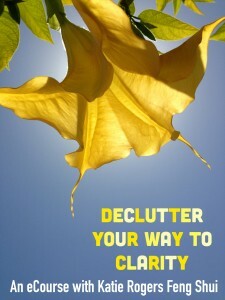 clutter-clearing and organizational tips and information to help you let go for good! a brand-spanking new outlook on life!!! Consider this program an educational and fun way to get a kick in your pants for the changing of YOUR season…by using feng shui! Here’s the best part. It’s totally CHEAP. For $1.67 A DAY, you can be part of this awesome group and experience. I mean, honestly, there is no excuse. You’ll probably find that money in your sofa cushions the first day of the program. And remember, this is the perfect program for beginners and experts alike!!! In February of last year, I participated in Katie Rogers' Declutter eCourse. It was the only thing I talked about because it literally changed my life!!! In a prior attempt to declutter myself, I had gotten rid of two purses and one sweater. Ha -- What a joke! Through the 27-day e-mail course, I got rid of about half of my stuff, because that's how much I really didn't use, need or want! Most significantly, I was able to [energetically] let go of my ex-boyfriend by giving away stuff that reminded me of him, like my couch and chair that had belonged to his grandmother. Shortly thereafter, my beautiful friend Amy gave me her couch, which is way more comfortable and looks better with my stuff. I also felt more comfortable inviting people over, and everyone noticed and commented on how relaxed they felt at my place! Yay, victory! For me, it was easier to give stuff away than to sell it, so about once a week, I was filling up my car with bags of stuff and dropping them off at various thrift stores around town. Plus, I gave lots of stuff to friends and neighbors, which felt really good. For example, the couch and chair went to a girl whose giant puppy had eaten/destroyed her couch. Anyway, if you have thought about decluttering, do this program, and thank me later (wink face). This has been a super-charge!!! Love it!! I want an e-mail from Katie everyday for the rest of my life!! It works!!! The most impactful thing I took from the course is the importance of decluttering – I can't stress that one enough. Once you have done it, you see and feel the results. Seeing is believing! Our apartment feels much lighter and cleaner as both my husband and I cleared out a lot of things during the program - both in our home and personally! I think my personal shifts have been subtle but somewhat powerful. Meaning, no major life changes have happened as yet, but I certainly feel stronger, grounded and more connected to the higher realms than I did before. I also feel I have cleared out old energy patterns to make way for something new to come into my life. It’s a fabulous class, and I would love to do it again! Establishing a decluttering mindset is one of the best things anyone can learn. I would recommend it to anybody of any age: families, couples, single, young, old, hoarders and even tidy people! Anyone could use help in decluttering their space, learn more about themselves, and benefit from the personal shifts that will result - you can guarantee that! I'm so happy to be a part of this program again. 2014 was one of the best years of my lifen and I credit your program with much of that. I've also been meaning to write and thank you for your advice about placement of my desk in my [office]. It has made a big difference! Thank you so much. …Oh and you should know that things continue to shift for me. I've been wishing for a nice vacation and having mentioned it to my mom she's booked our entire family (including my sisters-in-laws) on an amazing Disney Cruise for the fall. This is completely out of character for her and it was just another giant wooooosh of something I'd been thinking about, hoping and wishing for that has amazingly come to fruition since starting this process. So thank you again! After years of struggle and confusion, I have broken free. I'm feeling so good. 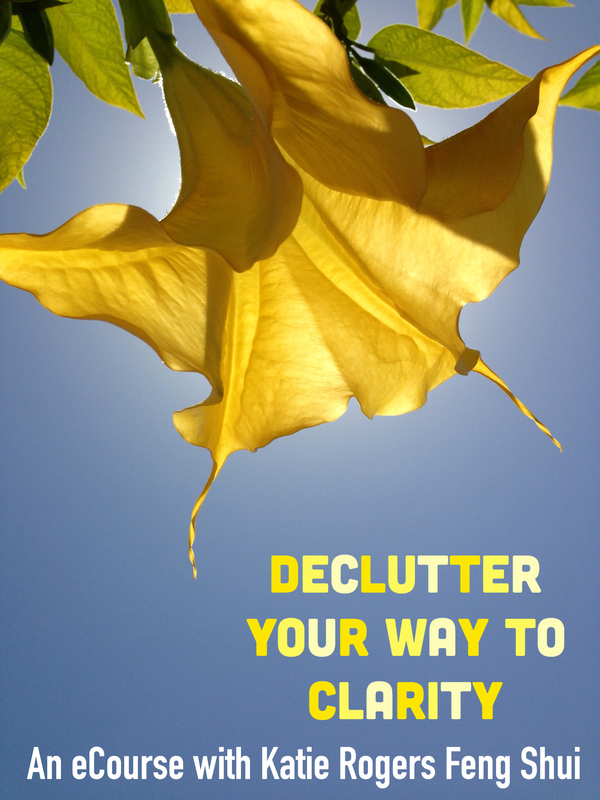 The decluttering has helped me focus on what I want in my life and my space and to get some of the clutter out. Thanks so much and I look forward to having your expertise continue to help me move forward with the joy of creating my life! Also, I just got an unexpected and substantial raise. And I got news today that I am potentially about to be further supported in my work (more money, a little less work on my plate, is it possible?) YES! The Universe is abundant, and I am so grateful to be releasing things to allow other wonderful experiences to come into my life. I decided to take Katie’s declutter eCourse to give me some guidance and motivation because I was overwhelmed with clutter and looking for guidance on techniques to try to keep it under control. It was very frustrating! Although, on some level, I think I recognized that the clutter had an emotional impact on me, it became more clear to me after taking the course. Even after the course was done, it still made me think about things at home and how they were impacting my peace of mind. The course motivated me to keep working on decluttering, resolving problems, and working on some new plans for the future. I would recommend this course to others who are open to the idea of Feng Shui and who are disciplined enough to do the online work/study!